This short trip to the convent will give you a feeling that you are away from a crowded busy city … on an island of calmness and peace. If you do not forget to grab some bread from your hotel or buy it on the way, you will be able to go down to a beautiful pond, where newly wedded couple take photos and feed ducks. 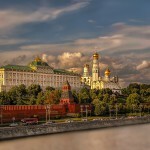 New Maidens Convent – is the second most popular city tourist destination after Moscow Kremlin. This unique, protected by UNESCO as world heritage, convent of the 15th century is one of the oldest stone build churches in ancient Moscow – Cathedral of Smolensk. New Maidens Cemetery is the most prestigious cemetery of the former Soviet Union with the endless list of noble men buried, scientists, musicians, poets, actors and other famous people. The price per each person is calculated according to the quantity of people in the group.